Red carpet event coverage is some of the most love-to-hate television in our culture, the brouhaha and pomp of the glamorous people in fancy dresses and tuxedos imbibed from the comforts of our own homes, often with wine and sweatpants. The regular rotation of hosts—E!’s Giuliana and Terrence J, most reliably, if reliably grating—preserves each event with the required breathless enthusiasm, inquiring quizzically about who are you wearing and how are you feeling and what will you do if you win. You can’t really blame a host for the banality of these questions, primarily because red carpets ask each attendee to spend a preordained block of time with media outlets literally on the sidewalk to the venue; it is often less than the amount of time it takes you to give directions to a tourist. But also because these questions serve a very specific purpose—at their basest, by perpetuating the capitalist merry-go-round that is the red-carpet-approved designer, via a massive tangle of professional stylists acting as conduits between moneyed fashion houses and the biggest names. Truly, more creative questions are possible, but for the most part the host is there to blend in, and to prop up the celebrities who have granted their precious time and cachet to the outlet. Yet regardless of the physical impossibility of having a more-than fleeting conversation with a star, there are hierarchies on the carpet. Broadcast news is at the top of the chain, of course, based on their reach and amiableness to the celebs; independent blogs are somewhere near the bottom. It is perhaps slightly different at the Tonys, where Joanna Rothkopf and I were sandwiched between a press fence and a parking sign, both of us covering our first-ever red carpet (the fact that I have managed to avoid red carpets for the duration of my career is a miracle that has mostly been on purpose); the level of coverage is slightly ratcheted down from, say, the Oscars or the Emmys—because, let’s face it, far less people care about New York theater—and other than the ghostly and ethereal visages of actors like Cate Blanchett and Lucy Liu sweeping down the carpet with nary a glance at the press line, people for the most part are willing to chat. It was this cute-kid tactic that resulted in this clip, perhaps Lin-Manuel Miranda’s only red carpet interview; half of young Iain’s conversations seemed to include an interlude of him tap dancing on his own stool, which thankfully seems to point to a career on the stage. All the while, the adults were flailing in the press pen, yelling names and hoping for attention; even expression of exceptional knowledge didn’t, didn’t seem to matter. I screamed, “DAVEED, I LOVE CLIPPING, COME TALK TO ME!” a moment that, as a journalist, I do not feel proud of, but did nothing to produce the desired effect. And yet! Yes, I am feeling incredibly GET OFF MY LAWN about a child, because I, too, am a monster. At any rate, we interviewed a few people in between feeling totally meaningless, which is the only way a red carpet can really go; after a certain point, we realized that the only way to viably cope with a red carpet’s specific level of controlled chaos yet distinctly conservative operational values was to give in to delirium and roll with the punches. It was at this point that we just began screaming “MOM!” at celebrities with whom we knew we stood no chance at interviewing in this forum—which turned out to be great fun, and can be seen in these Snapchats. JEZEBEL: We are wondering what your inchoate, high school theater experiences were like. Do you remember the first set you designed in high school? DAVID KORINS, HAMILTON SET DESIGNER: I didn’t design a set in high school, I was an actor. I wanted to play the part of Billy Bigelow in Carousel, which is the lead, and I didn’t get the part. Instead I got Jigger Craigin, which is the second male lead, the bad guy, and I was so hurt that actually the director of our show encouraged me to go check out the sets being built. That was actually the thing that got me into set design, so having that bad audition experience really pushed me over the edge. JEZEBEL: Oh, that’s heartbreaking, though! KORINS: Well, it’s good for me! JEZEBEL: Right, Hamilton! I guess it turned out okay. JEZEBEL: Danielle, do you feel amazing?! 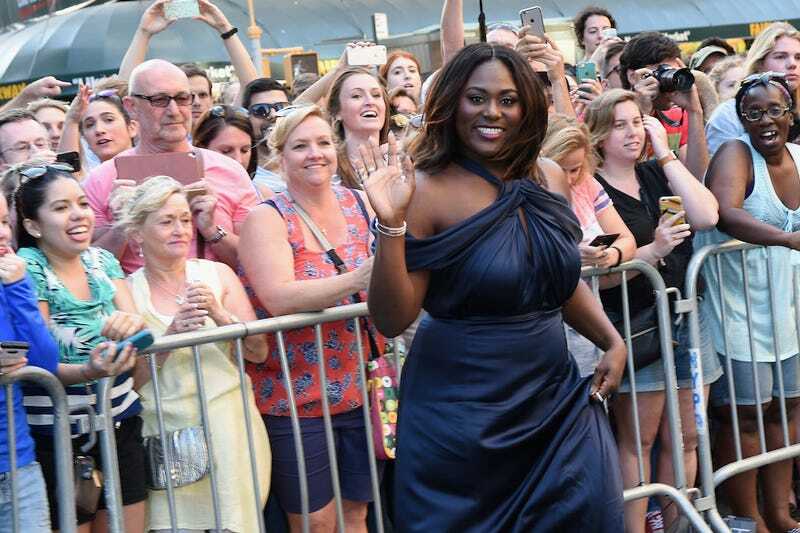 DANIELLE BROOKS, THE COLOR PURPLE: I do! BROOKS: Thank you, I’m here! I’m really grateful!! JEZEBEL [screaming]: JOURDAN, WHEN’S THE GRIME MIXTAPE COMING??? JOURDAN! JEZEBEL: Do you remember what your favorite high school musical was? TAVI GEVINSON, THE CRUCIBLE (AND MY SOMETIMES-BOSS): Oh, I never did musicals in high school but I did do community theater, just to clarify! Oh, man. I loved Fiddler on the Roof. JEZEBEL: I KNEW YOU WERE GONNA SAY FIDDLER!!!! WHO ARE YOU WEARING! JEZEBEL (screaming): CHRIS, WHAT’S YOUR FAVORITE RAP SONG RIGHT NOW? JEZEBEL (Joanna Rothkopf, screaming): DAD! DAD!!!! Congratulations to all the Tony winners! See you next year!